The dog featured above is that of Bryn Anderson, a Washington-based artist, who, in 2014, posted photos on reddit and Imgur of Nixe (who now has her own Facebook page) painted as a skeleton. She got lots of positive comments, but many people were concerned about Nixe's safety. 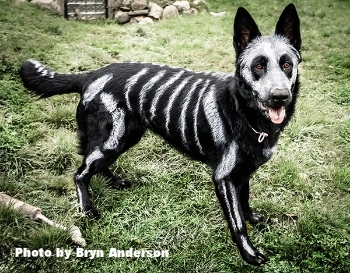 Fortunately, as Ms. Anderson points out (many times), she used a non-toxic face paint to turn Nixe into a "skeleton dog" and took many other precautions, too. Additionally, as she writes, and as her pictures seem to support, Nixe is a very relaxed dog who wasn't bothered by the painting process. While I understand why you might want to decorate your pets in a similar fashion, do keep in mind that Nixe (and other pets like her) tend to be the exception, rather than the rule, when it comes to being painted or dyed. These decorative flairs are often more fun for us then they are for our pets, so please consider these few tips below should you get the urge to paint your pet. Use a pet-safe paint. This pet paint claims to be veterinary approved. Unfortunately, they don't share any of the studies supporting their safety claims, and they don't cite any veterinarians who provide recommendations. If you decide to use it, test it first on an easily-washed part of your pet and monitor closely for any bad reactions. If you plan on making your own homemade pigments to paint with please beware of their potential toxicity. See tips #3 and #7 below. Consider their tolerance and stress levels. Many dogs, and most cats, won't be overly excited about or eager to stand still long enough for you or your groomer to apply a hair coloring product to their coat. Consider doing it in short stages, keep the intricacy of your design very minimal or basic, or if your pet really doesn't like it, just don't put them through it. Beware of an attack! Depending on the type of product you're using to dye or color your pet's fur, you may even be increasing your pet's risk of suffering from a dog, cat, or wildlife attack, too. Many of the home DIY products people recommend for coloring pet fur are food-based. People advocate using the juice from certain fruits and vegetables (berries, beets, asparagus, and a host of other foods have been suggested), they also recommend using human food grade food colorings, and some even advocate using Kool Aid powder. While some of these may be safer, all will likely attract intrusive attention from other animals - leading to unwanted sniffing, licking, and pestering, which will be stressful for your pet and could easily escalate to a fight and resulting bite wounds. Where you apply it is important. If you're going to paint your pet for Halloween or any other festivity make sure to avoid the eyes and mouth areas. Also, if they're lickers (Tip #3) you should keep the paint limited to areas they can't reach like their back or top of their head. This doesn't really apply to cats though, as they can use their paws and seemingly contort to clean pretty much everywhere. Avoid irriation and allergies. Anything you put on your pet's skin or coat has the potential to cause irritation and/or a true allergic reaction. This is true whether or not the product is designed and marketed for use on people or pets. It's even the case with the shampoos and conditioners you may use to remove the coloring from your pet's fur. Of course, such reactions are less likely to occur if you use a pet-specific product, but they can (and do) still occur. Don't fall for the "what's safe for people is safe for pets" assumption! This assumption couldn't be further from the truth. It's (sadly) a very common assumption, and it's a very dangerous one that can prove debilitating or even fatal to a pet. Here are just a few examples of foods that are safe for people, yet dangerous for cats and/or dogs. So, Painting May Not Be Right For Your Pet – What About A Pet Costume? Depending on your pet's personality and the type of costume your planning on using (and the situation in which you'll be doing so), a costume might be a better match for your pet. But, of course, this isn't a "one size fits all" situation either. There are a whole bunch of potantial problems to be aware of here, too. Many pets are brought into the ER around Halloween because of innapropriate costumes. To avoid problems, choose a costume that fits right (not too loose, not too tight) and one that doesn't obstruct your pet's mobility, vision, or breathing. Never leave your pet alone wearing their costume without observation and avoid costumes with dangling fabric, bells, or other decorative pieces that could easily trip up your pet or find their way into your pet's stomach. Take the time to get your pet used to their new costume. Put it on one piece at a time to let them acclimate and give them plenty of love and treats to make it a fun and rewarding experience. But always follow your pet's lead, if the whole dress up process is stressing them out, just don't do it. Done right, costumes can be a fun time for you and your pets and they can make for some adorable pictures. Done wrong though, they can result in a multitude of problems. 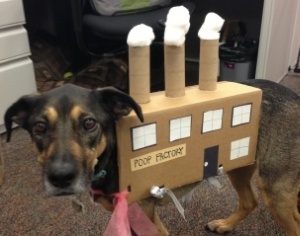 For a fun costume idea, check out my friend's dog, Ellie, on parade as a "poop factory." This costume is fun, imaginative, and safe (the cotton balls were glued in) - and in Ellie's case, couldn't be more true! She may be looking a little timid posing for this picture, but she truly wasn't phased by her costume, and she certainly had no trouble getting around and visiting all of her friends! And, of course, she was never left unattended while wearing it. For more awareness and tips for helping your cats and dogs (and by extension you) have a safe and fun Halloween, please see our Halloween Pet Safety article.